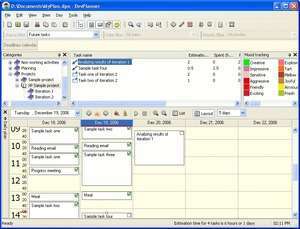 DevPlanner is a hierarchical planning and estimating tool. It helps managing tasks and daily schedules. It shows early and current estimates, as well as actual time spent. Tool provides history navigation, customizable reports, including project reports and timesheets, powerful search and time tracking. DevPlanner 2.3.59 is a shareware program and can be used as a demo to try the software until the free trial period has ended. A full version of the program is available after the trial period ends. For security reasons, you should also check out the DevPlanner download at LO4D.com which includes virus and malware tests. Additional screenshots of this application download may be available, too.